A simple village expansion for Darkwater Crossing. Ownership on Meieran's barrels, chickens, and his bed was not set. A cupboard inside Sondas' house clipped with a barrel next to it when opened. Cooked slaughterfish in Tormir's house were clipped into the plates they were sitting on. It was possible to get stuck between a rock and the bridge behind Meieran's house. If Darkwater Crossing ever seemed like too many people with nowhere to live were there, you're probably right. It's major enough for Tullius to know about it to set up an ambush for Ulfric, yet there's a single house there where two people live while everyone else sits around a campfire. Not anymore! 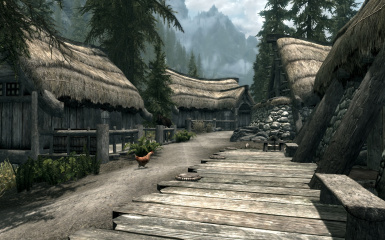 Three new houses have been added to provide accommodations for the 4 NPCs who had no place to call home. Drop the archive into your Skyrim Special EditionMods\Bash Installers folder, then install as usual. Use the "Download with Manager" button. The installer should take care of things from there. Drop the Darkwater Crossing.esp, Darkwater Crossing.bsa, and Darkwater Crossing - Textures.bsa files into your Data folder. To remove the mod: Delete the Darkwater Crossing.esp, Darkwater Crossing.bsa, and Darkwater Crossing - Textures.bsa files from your Data folder. Then reload your game as usual. 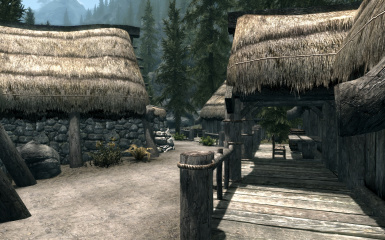 This mod must load after Skyrim Bridges or the landscape and navmesh changes will be wiped out and the NPCs will not be able to access their homes. This mod must also load AFTER Immersive Citizens - AI Overhaul or the navmesh data will be overridden in areas where the new buildings have been added and the NPCs will be unable to navigate properly. 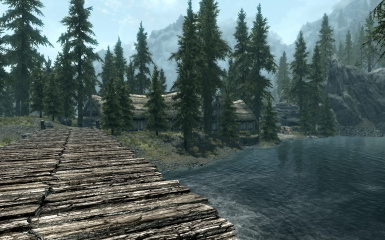 Will not be compatible with other mods that change the Darkwater Crossing exteriors.